Here are the orginal game requirements for anyone intrested. Enemy Nations is a Win32 application. It can run on Windows 3.1 (using Win32s), Windows95, Windows 98, Windows/NT 4.0, Windows 2000, & Windows ME. However the needs of the operating system change the minimum requirements between systems. Enemy Nations runs at 24 fps (frames/second). Therefore it needs to be able to push a lot of pixels to the screen quickly. If your video card is not a VLB or PCI video card, or equivilent, there is no way it will be fast enough. (Virtually all Pentium systems have a PCI video card.) Also, if your screen resolution outclasses your processor you will need to drop your screen resolution. For example, running at 800x600x8 is pretty much the maximum for a 486/66. We have tried to avoid filling up your hard drive when you install Enemy Nations. Therefore the game requires only 4Meg of hard drive space. (The demo requires more because there is no CD.) But when running Enemy Nations requires a minimum of 60Meg of virtual memory. Therefore Enemy Nations requires that your swap file be at least 60Meg. We belive this is a superior solution to installing a 60Meg game file. 486/66 with 8Meg of memory minimum. Pentium with 16Meg of memory suggested. Note: if you have less than 20Meg of physical memory on your system you will need to increase the limit allowed for virtual memory. The setup program guides you through this but you do need to change it. 486/66 with 8Meg of memory minimum. Pentium with 8Meg of memory suggested. Basically NT (running nothing) requires a Pentium with 16Meg of memory to run nothing. Therefore we suggest a P/90 with 32Meg of memory as a minimum. 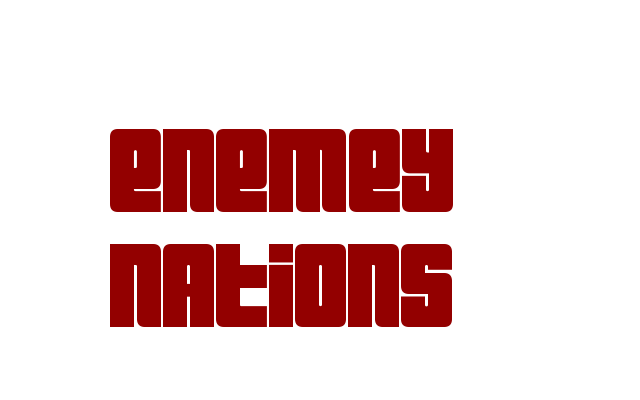 Enemy Nations has native support for TCP/IP, IPX, NETBIOS, TAPI, MODEM, & Serial multi-player games. (TAPI, MODEM, & Serial are 2 player only.) You of course need to provide the network. Enemy Nations has built in support for finding all opponents presently looking for games on the Internet. Enemy Nations will automatically show all games on the Internet about to start.